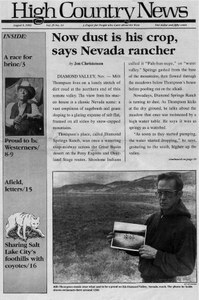 Groundwater pumping dries Milt Thompson's Diamond Valley Ranch. A wary rancher joins an environmental group after groundwater pumping dries his ranch. Can Dan Beard reclaim Reclamation? A profile of Dan Beard, head of Bureau of Reclamation, shows his role within the Department of the Interior. Lizard skin leads the author to musings on nature. 'Creating a Forestry for the 21st Century' brings forestry experts together in Portland, Ore.
International mining pollution prevention conference in Snowmass. The Colorado Air National Guard offers a revised plan for F-16 pilots at Redeye. A Land Trust Alliance rally is held in Big Sky, Mont. 'It's Not Easy Being Green' newsletter is a wake-up call for Christian environmentalists. White Sturgeon may be designated as an endangered species. Rep. Karen Shepherd spearheads resistance to missile flyovers in Utah. Only three sockeye salmon return to spawn at Redfish Lake. The army resumes chemical weapons testing at the Dugway Proving Ground. The Colorado House approves legislation proposing 711,170 new acres of wilderness. The High Country Citizens' Alliance and the Gunnison County Stockgrowers work together on a grazing proposal. The Oregon Bar Association considers sanctions over harrassment charges against Packwood. The Silver State Leasing Co. receives $100,000 fine for killing a desert tortoise during construction near Las Vegas. Arson could create fire-fighting and salvage timber jobs in Willamette National Forest. 'Trouble' the grizzly bear is still on the run. Arizona Senator DeConcini is accused of doing favors for a recycled toner business. A rodent expert says that predators could help control hantavirus-spreading deer mice. An Ancient Forest Rescue protester is arrested for blocking a timber sale by sitting in a tree.